Clearly, more than Ralph’s life depended on this. In “Jurassic Melonpool,” Ralph was an entirely different character. He actually was closer to Ralphie back then, so I never really addressed the whole “how Mayberry became captain” issue. In the “Old School Melonpool” years, people asked me repeatedly emailed or asked me why Ralph put up with Mayberry as captain. This storyline will hopefully make a little more sense this time around — even though it’s quite a bit different. One of these days, I’ll figure out his many alternate universes and reboots I’ve actually done — I’ve been operating under the usea that this is the second — but this doesn’t cover the Melonpool Chronicles comic book, Palomar College, Jurassic Melonpool among others. Yikes! 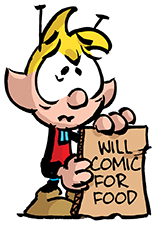 One other note — With the reboot, Ralph has a whole set of expressions I haven;t been able to use for about 15 years — the ones reserved for Ralphie. It’s been really interesting for me to write and draw for Ralph with a less-limited palette. While I miss Ralphie, I like the broader Ralph. Curious how you’re going to ultimately handle this.